DVD Synopsis: A little girl is brutally slain by a vampire in a tiny 19th century Austrian village. Seeking revenge, the townspeople invade the foreboding castle of Count Mitterhaus and kill him for the crime. As the Count dies, he curses the villagers and vows that their children will all die so that he may someday return to life. Fifteen years later, as the village is ravaged by the plague, a traveling circus comes to town and distracts the villagers from their current hardships. Vampire Circus is yet another movie that caught me by surprise, a film I knew next to nothing about prior to watching it, but which was so well-made that I found myself completely drawn in. 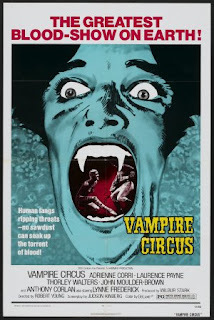 But then, I really shouldn't have been that surprised by Vampire Circus; it is, after all, a Hammer Film. It's the 19th century, and The citizens of a small Austrian town have had enough of their local vampire (Robert Tayman). So, they rise against him and finish him off with a well-placed stake to the heart. But before dying, the vampire puts a curse on the town, and vows that the blood of their children will one day be spilled so that he might live again. Fifteen years pass, and the town (which has never been the same since that fateful day) finds itself in the midst of dealing with a deadly plague. Cut off from the surrounding villages as a result of the disease, the townsfolk are pleasantly surprised when a traveling circus comes rolling in one day, offering a much-needed diversion from their daily misery. But these particular circus performers are interested in more than the town's money, and it isn't long before the residents learn the truth about their new "visitors". One of the things I've always admired about Hammer's horror films is the way they look, the perfectly realized set pieces and authentic costumes that really bring their worlds to life. With Vampire Circus, the designers took full advantage of the film's 19th century setting to produce an absolute masterpiece of set design, but like most good Hammer films, the beautiful world created for Vampire Circus is a sharp contrast to the bloody mayhem that occurs within it. The film's opening scenes take place in the vampire's exquisitely decorated castle, yet what transpires here is far from elegant; a young girl is lured in and murdered by the vampire, an action that leads to the initial bloody confrontation with the townsfolk. In the best Hammer films, such conflicting juxtapositions (unspeakable savagery played out against refined backdrops) are commonplace. And make no mistake, Vampire Circus is one of the studio's best. Right on the money with your comment: "I really shouldn't have been that surprised by Vampire Circus; it is, after all, a Hammer Film." Although I have yet to see this one - I've yet to see a Hammer film that wasn't worth watching! @Klaus: Hammer has released some of the most interesting horror movies that I've ever seen, and VAMPIRE CIRCUS is right up there. I strongly recommend it. David Prowse is badass in this film!